Sidewalk Toronto isn't a project about urban planning. It's about a private sector firm building itself into our infrastructure and harvesting our data. 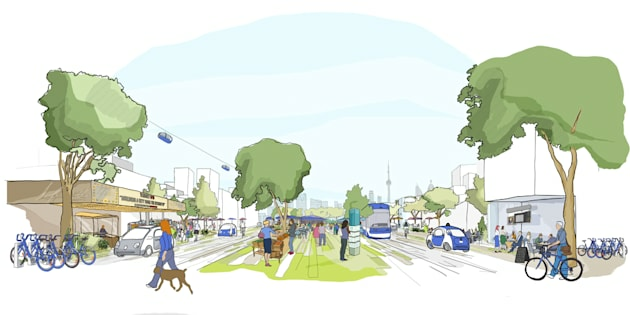 Sidewalk Labs, sister company to Google, recently won a bid to work with Waterfront Toronto as an innovation and funding partner to help create a Master Innovation and Development Plan for Quayside, a parcel of land on Toronto's eastern waterfront. This project is called Sidewalk Toronto, and as part of the project, Sidewalk Labs will invest up to $50 million dollars over the course of the next year to help create the plan. No land is changing hands. Instead, this is a $50-million investment in smart city R&D. As part of its bid, Sidewalk Labs submitted a 200-page vision document. It envisions Quayside as a tech-rich and data-informed neighbourhood, using tech as a tool to create a safe, sustainable, affordable place to live. In the excitement over this innovative economic development project, all levels of government are forgetting or ignoring that we haven't had a national discussion about our data, related public infrastructure, and the degree to which we want big tech influencing our governance and public services. Multiple fundamental pieces of legislation that will govern this project sit at all levels of government. And they're out of date. The discussion that Sidewalk Labs wants us to have is about local urban planning. They want us to talk about affordable housing, safe streets, data privacy, environmental sustainability and community benefits. They want this to be the framing of the project, because who would oppose any of that? What they don't want anyone to be asking is whether this project should be happening at all. The plan involves the possibility of a private sector firm building itself into our infrastructure and harvesting our data. Sidewalk Toronto isn't a project about urban planning. As a smart city project built around sensors and data collection, the plan involves the possibility of a private sector firm building itself into our infrastructure and harvesting our data. It's a market-making project that necessitates an urgent national discussion and review of our existing laws and policies on data, procurement, privacy and more. There are domino implications regarding how private sector technology may impact public service delivery; how this model may further erode the tech capacity of the state; and what that does to our ability as a nation to operate independently of technology vendors. Most importantly, there needs to be a discussion about other ways to make our cities smart. Private sector leadership is not the only way. We owe it to ourselves to think hard about how to apply the many benefits of technology to our governance: how we deliver our public services, and how much of this work should be government owned and led. This business deal is murkier than standard privatization or public-private partnership. When these involve hospitals, roads or transportation, the public understands what the private sector is providing. In this case, with data and machine learning driving some of the background work at Sidewalk Labs, we can't see the whole story or fully understand what the private sector walks away with, potentially to the public detriment. This is a national conversation that must start now. Last year, Alphabet generated over US$90 billion in revenue, and 88 per cent of that came from advertising, a data business. Meanwhile, the top five big tech firms (Google, Facebook, Apple, Amazon and Microsoft) now outspend Wall Street two to one on Washington lobbying to fight regulation. Tech giants are moving faster than the lawmakers. In this vacuum of law and policy, as law professor Lawrence Lessing wrote in 1999, software code becomes law. There are ways to maintain technological sovereignty and control, and to use public data to inform truly public services that don't rely on a range of proprietary tech solutions. Those options must be explored before the year is up, otherwise the solution we're presented with for a smart city is the only one we'll discuss. Toronto shouldn't be left to figure this out — this is a national conversation that must start now.